You might put off buying one of these handy snow blowers because you’re certain that they’ll eat up a full paycheck and then some. While that might be the case for other snowthrowers or snowblowers (there’s a difference), The Toro SnowMaster 724 QXE is an affordable option for most users who want an easy to operate machine, but that’s not why we’re excited about it. For an affordable price, you’ll get an entry-level machine that is capable of handling light fluffy snow or average conditions, anything more than that and you may want to consider a two-stage snowblower instead. This single stage snow thrower is self-propelled, which means the speed is determined by how fast or slow you walk. Anyone that feels like a snow blower might otherwise run off with them, or if you need something that will accommodate your back or wrist injury, then this feature is great to have. Some machines can be heavier which might mean they’ll be able to handle bigger snow-loads, but this also makes them more difficult to maneuver. With this snow blower, you’ll find that it’s not only light and easy to maneuver, but changing directions is easy compared to some other machines. Another hangup where people tend to scrutinize a snow blower is the ease and ability to change the chute direction. Some require adjusting various levers and gears just to get the right height and angle, but Toro has something even better. With the Quick Stick, you can easily adjust the chute height and deflector angle with a series of clicks depending on your preferences. Once you figure out how to use it, you will never need to refer back to your user manual in order to use the Quick Stick. Before your first use, we recommend following the instructions in the owner’s manual to “season” it before its first use. After you do that, just a couple of pulls of the pull string and you’re ready to go. With the Toro SnowMaster 724 QXE snow blower, you get a 24-inch clearing width on flat surfaces like concrete or asphalt. The 40-foot throwing distance makes it perfect for two car driveways since you can direct where you want the snow to go. 11-inch Deep lug tires are larger and have a tread built specifically for traction so you won’t slip and slide all over the place. Rarely if ever will you have to pull out the tire chains. Automatic steering so you can focus on the path ahead without fighting with the snow thrower on where you want to go. There’s no pushing or pulling needed and you don’t need to worry about memorizing what each trigger or lever does (there are none!). Once you get the machine going, you direct it where you want to go, adjust the snow chute to where you like it and before you know it, your driveway is snow-free. The Toro SnowMaster 724 QXE claims that it can clear up to 25% more snow per minute vs most other machines. We think the snow chute has a lot to do with this claim. The auger housing is wide and open to take in large snow loads. Because of this, the machine makes quick work of the snow in its path. Some snowblowers require you to have to adjust and toy with various controls just to get the right angle and height on the snow chute. This can cut into time and also become tiresome when you just want to get your driveway cleared up so you can go back inside and relax. With the Quick Stick chute control, you can easily adjust where you want the snow to be thrown as well as at what angle. It’s literally set and forget. It couldn’t be any easier than that. Certain machines handle different types of snow better than others. We and other consumers found that while it handled most types of snow like a champ, it was especially effective with light powdery snow but would handle some wet and heavy snow. Because of the tall and efficient auger housing, there’s less of a chance of snow becoming compacted and clogging the machine, which is common with heavy or wet snow conditions. Toro isn’t the first to have come up with a self-propelled snow machine, but it’s definitely worth mentioning here. With the self-propel system, you can use the machine at the speed you like without having to mess with more gears and levers. The handle is sensitive to your weight so as you push, the machine determines whether or not it should speed up or slow down. To take advantage of this feature, just walk with your elbows bent at your sides at a pace that is comfortable to you. This Snowthrower will do the rest. Everyone knows that with more parts comes the likelihood of breaking down over time. With the Toro SnowMaster, the entire frame is all one complete structure so you don’t have to worry about various parts breaking down as the years go by. Because of the investment of one of these machines, no one anticipates going and purchasing a new one six or so years down the road. You shouldn’t have to either. The chute direction control is not near the handle which can be inconvenient to some. Instead, you’ll have to reach over the unit and change the direction manually, but it’s easy to do. We also noticed that on blacktop or paved asphalt, that a thin layer of snow may be left behind which could cause ice to form. The skid guides are not adjustable so there doesn’t seem to be a way to correct this. Now on varied terrain, things can get tricky. Uneven terrains are this machine’s worst enemy. Unless your driveway is completely flat, you’re going to have a rough time. While it might actually clear the snow, it will also pick up gravel and whatever else is in its path, and hurl them into surrounding vesicles and windows. Sometimes driveways are set up on slopes. If your property is like this, you’ll be able to clear the paths, but keep in mind that this particular unit doesn’t come with a back-drive which would otherwise keep the machine from running away from you while descending down the hill or slope. If the slope is severe, you might want to consider picking up a Toro 2-stage to help navigate the terrain better. 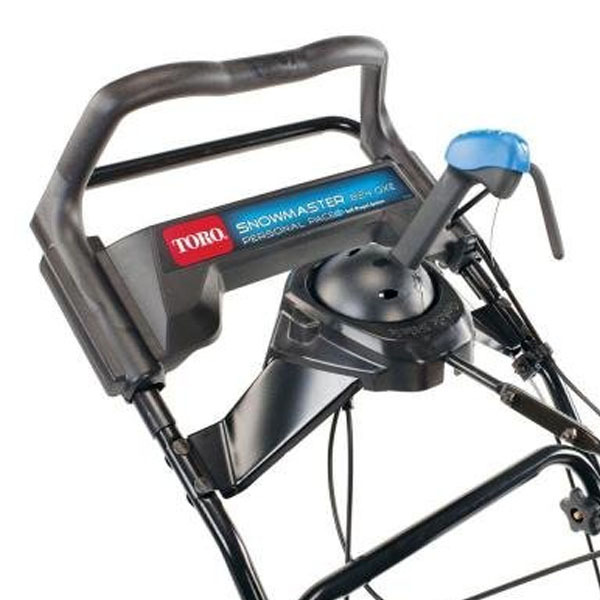 This snow thrower definitely isn’t for you if you’re looking for an electric start. Being able to use a push-button start can make a difference on frigid mornings where it’s difficult to get the machine to start. Instead, the engine is powered by a pull-string type setup. Most consumers report that 1-2 pulls is usually enough to get it up and running, but make sure you prime it first and then turn on the choke. We think that if you need a snowblower that can handle small to average snowfall, without all the extras (LED headlight, electric push-button start,) then this might be the snowblower for you. Do you have a smaller area to cover? The Toro snowblower will eat the snow right up with no problems. We noticed a trend that elderly folks or people recovering from injuries (back/wrist surgery) purchased and reviews this snowblower. If it wasn’t the elderly, it was complete newbies who wanted the ease of removing snow without having to study an operation manual in order to use one. Everyone seemed happy with their purchase. Those who weren’t happy were people who attempted to use it on their gravel driveways or any ground that was not flat. This thing is designed to get super close to the ground, so it will kick up anything that’s loose and that could mean sending rocks hurling towards your vehicles or through windows. Overall we love this Toro snow blower. Compared to most other snowblowers of this price range, the Toro SnowMaster can handle light conditions and the occasional heavy snowfall. The gears are intuitive to use and the steel dashboard isn’t cluttered with a bunch of controls that the user needs to memorize in order to use. You’ll be able to read through the entire user manual in 25 minutes or less and surprisingly, the instructions are clear and some are even depicted with pictures showing you what to do. If you’re on a budget and don’t need all the bells and whistles, then the Toro SnowMaster 724 QXE might be just right for you. If you’d like to read more Toro snow blower reviews, check out what customers have to save on HomeDepot. The 724QXE is great and I just used the ELECTRIC START.